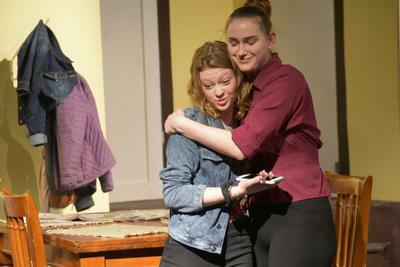 Jill McDonald and Ella Marshall perform a scene from the play Attached which will be presented on Saturday, March 23, at 6:30 p.m. in the Reach Performing Arts Center. The DISHS Theater Program will present an encore performance of “Attached” on Saturday, March 23, at 6:30 p.m. in the Reach Performing Arts Center. The show is written and directed by John Lincoln, and was the high school’s entry in the Maine Regional Festival at the beginning of March where it took First Runner Up at MDI High School. The play tells the story of the Monrow family who banter through life’s issues, big and small, until something evil makes its way into the house. It contains some adult language, drug references, and intense sense with mild violence. The show was recognized with a Special Commendation for Ensemble Acting at the Regional Festival. Additionally, All Region Cast awards were given for acting to Ian Cust and Jill McDonald. Drew Wendell was given both an acting award and a special commendation for his fight choreography. All tickets will be by donation and will help support the theater program’s trip to Broadway happening next month, when the Reach Performing Arts Center takes 17 students on a three-day trip to New York City to see a couple of shows, visit landmarks, and enjoy the city.